Singing or music has come into limelight with all the numerous singing competitions that have the capability of making someone a star overnight, however what goes behind the success is what we are here to see today. 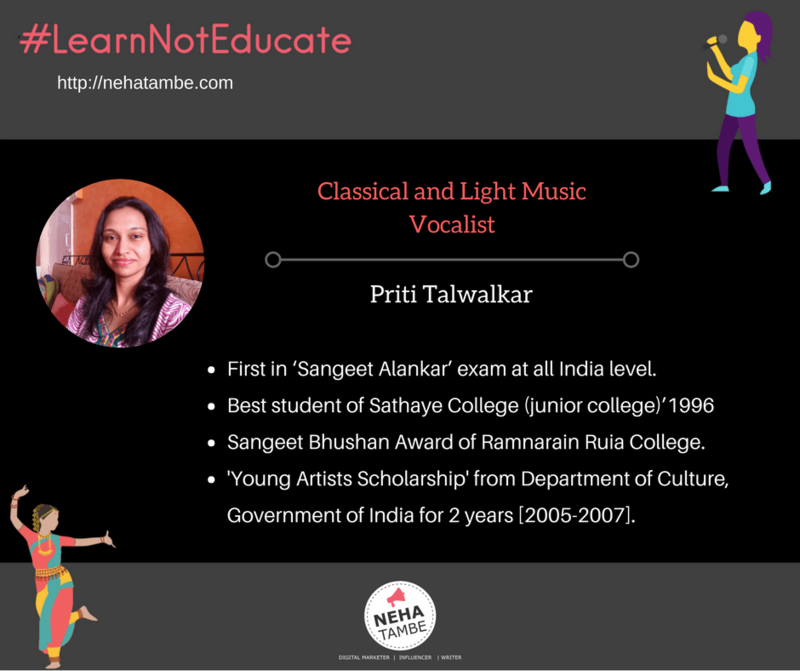 I met up with Mrs. Priti Talwalkar, a professional classical and light music vocalist to understand what it takes to be a singer! Having a great voice is just half of the picture. Read this interview to understand the passion and the effort required to be a trained singer. An alternative career, that if followed with passion and dedication can give you money and fame. When did you start learning singing? I started learning music in 6th std from Mrs. Swarada Sathe. After Visharad I started learning Jaipur-atrauli gharana gayaki from Smt. Manik Bhide (senior disciple of Smt. Kishori Amonkar and a great singer of jaipur Atrauli gharana). I completed sangeet alankar under guidance of manik tai and smt. Mukta Bhide. Presently I am learning from pt. Bhalchandra Tilak, another stalwart of jaipur gayaki. I always liked classical music the most and after 10th I decided to pursue music besides my college studies. I opted for arts so that I could focus on music properly. Are there any professional degrees or exams for being a well-trained singer? There are graduation, post graduation degree exams at the university level. One can do PhD after M.A in music. There are institutions like Gandharv Mahavidyalay where these exams can be given externally. Job as a Music teacher in schools, university. Private tutions or teaching in private institutes. Performing artist in classical, light music. There are other opportunities like playback singing, singing for albums, jingles, etc. What are your tips for the parents of such students? Parents should realize the ability of the kids and encourage them to acquire proper training. Help them get over the stage fright by making them sing whenever there are opportunities. Parents should treat this career equally important as any other career like doctor, engineer, etc. What should a student keep in mind when choosing singing as a career? According to me one should like singing very much and be passionate about it. 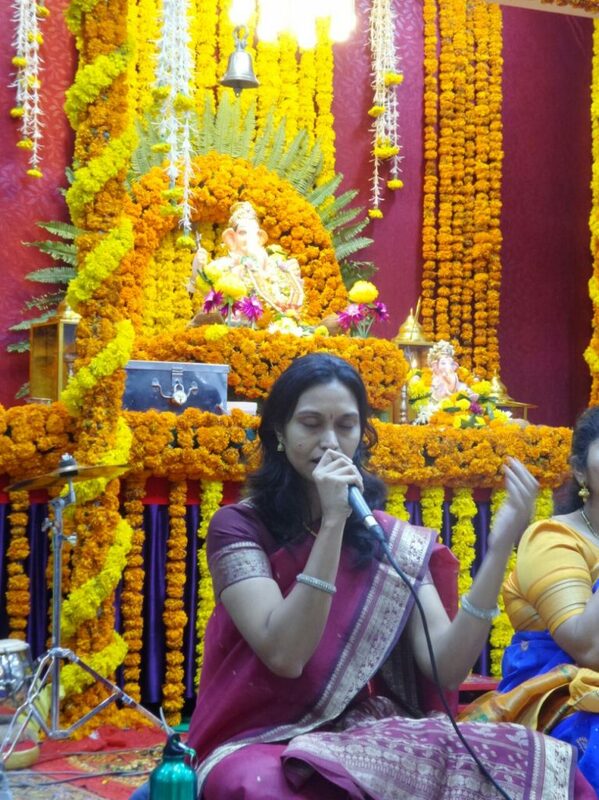 With the help of the guru (teacher) try to find out whether you are ready to become a singer. Competitions, exams, singing in front of the audience will help to improve. This can be a full time career. Proper training and riyaz are the most important things to become successful in this field. Coming from a family of academics, mostly scientists, I have always wondered how hard it would be to make a career in the performing arts. Thank you for this piece. You’re doing a good job with your Blogchatter Project :-). Priti is absolutely right..music or any performing arts is not something that one can learn and achieve success is they are not putting their 100% into it. Guru plays a major role in any shishya’s success. A Guru is like a second parent. Thanks Neha for sharing this with us. Absolutely Alpana. It is important that we understand, any alternate career cannot happen by fluke or along with something. It needs dedication just like any other career path. I wish to visit your blog since a long time, and today finally I did…you are doing such an amazing job, I like the interview, it was so inspiring, looking forward to reading more from you. Very inspiring post,as ito some extent i am attached with this field i really liked this post a lot. Thanks for sharing expert view.. I am a bathroom singer so singing “hum se na ho payegi 😉” But will definitely encourage my little master for the same.. I am really bad when it comes to things like singing and dancing. But it is truly inspirational to read about other people. Yes Sangeeta, every profession needs time, effort, dedication and talent. Not all can be everything, but we should recognize and appreciate every profession. very inspiring post love to know about PRITI TALWALKAR through your interview.. Thanks for sharing this wonderful woman’s journey. Best wishes to her. Great to know about Priti and her love for music, inspiration that she started out early in 6th standard and has achieved great. Well, not in terms of singing, but I feel calm when I listen to music. I am glad that you possess such a talent that can soothe others. This was a great read.. music has great prospects and it is important to identify our child’s interests and steer them in the right direction. She is an inspiration for many . Love to know about her. Will definitely share this with my sister, she is planning to make a singer out of her kid, who has a pretty voice! The post is really inspiring for many.. She is an wonderful lady I must say..
Times are changing and parents are more appreciative of other career options as well. I loved your post and it is indeed a wonderful career option for people with passion in this field. Wonderful post. It’s great to read about such a talented person and gain some inspiration. Though I lack any musical skills, I definitely would encourage my children to try out their interest in music of their choice. A good guide and drdication can help someone go a long way with natural talent.Music I love too.But taking up as a career would need talent which I think is needed. As parents it’s our duty to identify the talent in our kids and give them right direction. Her story is very inspiring. Thanks for sharing.